StevePavlina.com readers receive 20 free bonus templates. 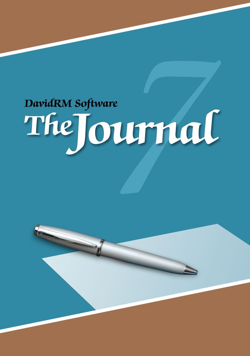 The Journal from DavidRM Software is personal journaling software for Windows. It lets you keep a private and secure journal on your computer. I've been journaling regularly since the 1990s, first in paper notebooks, then in Microsoft Word, and finally with dedicated journaling software. Good journaling software automatically links your entries to the dates when you wrote them. The software also provides features like searching past entries and assigning entries to categories. Your entries can include photos, audio, video, and more. You don't have to worry about losing your journal because you can easily make backup copies. The Journal is by far the best journaling software I've used. I've been using it since 2002, and it continues to evolve with fresh updates. With The Journal you can create private journal entries that include rich text, images, audio, and video, so you can make entries in whatever format you desire. You can drag and drop spreadsheets or other documents into your entries. For instance, you can include copies of your work-related files to have a record of your progress. Entries are easily searchable, and you can tag your entries with keywords and categories. This is useful for seeing what you've previously written about a certain topic. You can use The Journal to make dated or undated entries. Undated entries are useful for items you may want to review often, such as a list of your goals. You can easily make a vision board with The Journal by dragging and dropping photos (such as from your web browser or photo collection) straight into a journal entry. This is easier than creating a paper vision board or buying special software just for this one task. You can also blog directly from The Journal, so if you write a personal entry and decide to post it publicly, you can publish it straight to your blog. The Journal does an excellent job of blending convenience, power, and flexibility. I'm especially impressed with its attention to detail. The interface is intuitive, so you can jump in and start creating entries within minutes, gradually exploring more advanced features as you desire. The Journal comes with a free 45-day trial, so there's no risk to try it out. When you examine your life through journaling, you'll see new ways to improve, and you'll grow faster. Journaling helps you understand your purpose, values, and goals. You can see the road ahead more clearly. Journaling about your goals and projects is a great way to stay motivated and keep taking action. Journaling helps you understand and solve problems intelligently. It creates a record of your past decisions, so you can learn from them. Journaling helps you see what matters most, so you can stay focused on the core. Journaling expands and deepens your sense of self. It helps you define and strengthen your personal identity. Journaling increases your self-awareness, so you can live more consciously. Journaling brings your work, life, and relationships back into balance. Journaling helps you process feelings and develop a positive outlook. To provide even more value for you, I worked with The Journal's developer to create a special version for StevePavlina.com readers. This special version includes everything in the standard version, plus 20 extra journaling templates based on material from StevePavlina.com. These are designed to help you gain clarity, solve problems, discover valuable insights, and more. This bonus material is included for free. If you'd like to try The Journal for free, you can download a fully functional 45-day free trial version. The trial version includes the 20 bonus exercises that I created, so you'll be able to try those too. Note: The Journal is Windows software. You can run The Journal on a Mac with a Windows emulator such as Virtual PC or Parallels, or by using Boot Camp to run Windows on your Mac.